Positioners-Turning Rollers | R.J. Kates Co. 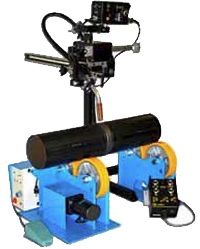 The Bug-O welding and cutting tools, displayed in the left hand photo, uses speed controlled rollers to turn pipe or other rounded material while the welding or cutting operation is performed. A remote foot switch allows hands-free run and stop control. In addition, a &forward/stop/reverse& switch with potentiometer allows for step less speed adjustment. An 8-slot turntable provides for quick mounting and holding of a fixture. 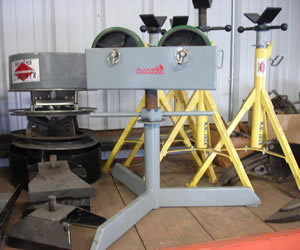 On the right is displayed a pipe that is supported on a roller stand at one end an a turning stand at the other end. These and other types of positioners and turning rollers are available from R.J. Kates. 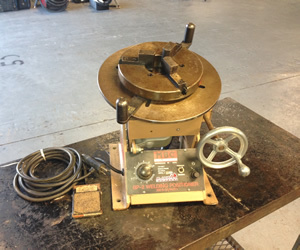 R.J. Kates carries a variety of stands for pipe turning and supports for your welding needs. 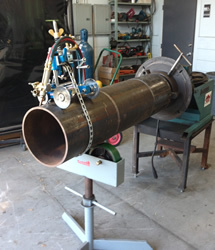 The MBP BP-2 welding positioner, featured on the right, has a capacity of 200 lbs. balanced load in the horizontal position and 100 lbs. balanced load in the vertical position. The BP-2 is a sturdy, smooth running positioner that will handle the loads and heavy demands of production MIG and intricate TIG welding.